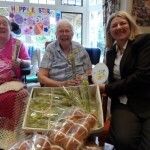 Funeral Arranger Jackie Packman from Lodge Brothers in Weybridge, paid a visit to the residents of Sutton Lodge, the local nursing home in Weybridge, to deliver hot cross buns and daffodils. Jackie said, “I have delivered Easter treats to Sutton Lodge for the past three years and it is lovely to see the smiles on the faces of the residents when I visit them. I really enjoy having a chat and being able to give these small gifts to brighten up their day”. Pictured is Jackie with residents from the home.